I received this strange puzzle from a seller who told me he can't understand how to play it. The rules on the back are indeed one of the most confusing possible. They mention "instructions" of 4 types cluing about the colors, but there are no any concrete instructions included. 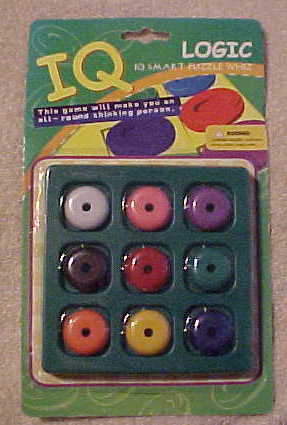 I supposed that this puzzle was possibly created to arrange IQ tests, but the clue sheets were lost somewhere, so I made some extra web searches and was able to find the shareware game Logic Squares for Pocket PCs. It seems to be the same puzzle (just Brown and Pink are replaced with Gray and Cyan), but this time it finally comes complete with randomly generated clues. Pocket PC is not something I have (I don't have any PC with Windows either) and I usually don't touch shareware games. So my only source for reverse engineering is this screenshot. And one clue seems to be missing on it for a unique solution, for example "Red is not top left". This seems like a pretty simple game, simpler than Sudoku. But still it can be ok for a child. Please write me if you have any additional info about this puzzle. 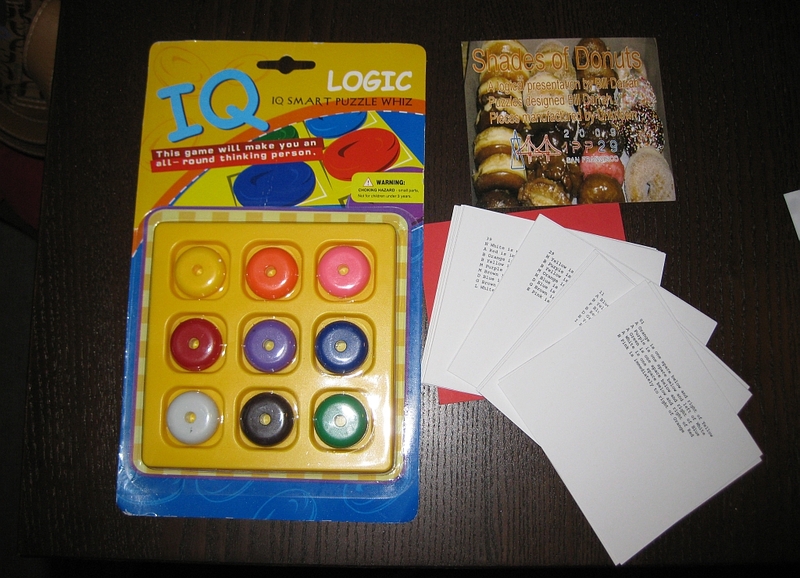 One day I can possibly finish my Play IQ Logic Puzzle page that can generate a new game (with new clues) every time. But I am not sure how far I want to go at spending my time on this puzzle.